The annual Winter Clearance sale has begun and the entire shop is 30% off when you use promo code “Brrr2014”. In additional, New York State and Vermont 2015 Calendars are marked down to $16 and New York State Magnetic Menu Planners/Grocery Lists are only $8! These calendars can help guide you to bring home the best food for you and your family. When searching for foods in season you have a better chance produce was been delivered from local farmers and picked at their height of freshness. This means your receiving maximized vitamins, minerals, and most importantly flavor. 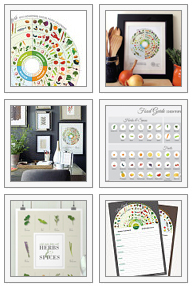 The food guides are produced within particular states and Jessica Haas Designs on Etsy has 15 states. Each loop in the circle is a category, dividing foods into herbs and spices, salad, fruit, protein and vegetables. This is a great way to help guide you to a healthy and eco-friendly 2015. If you don’t see the location you are looking for simply ask, it may be restocked soon or custom ordered. New states are arriving continuously. Happy New Year! This entry was posted in Calendar, Educate, Jessica Haas Designs' Work, Opportunity and tagged 2015 calendars, 30% off, California, Clearance, Colorado, etsy, food category, food group, food guide, guide, health guide, in season, menu guide, menu planners, new hampshire, New York, Oregon, produce, sale, seasonal calendars, seasonal guide, Shop, vermont, washington, winter vegetables, year. Bookmark the permalink.